A dog’s innate curiosity can sometimes lead them to danger. Prompt, calm action on your behalf will help greatly in the event of a dog emergency. Remaining calm yet responsive in your body language is critical, as animals can sense unease. Knowing what to do in a dog emergency can mean the difference between life and death. How well do you really know what to do if a sudden accident or crisis happens with your dog? Moreover, do you know what constitutes an emergency and how to be prepared? Later this month, we’ll be starting the Pet First Aid Distance Learning Program from Walks ‘N’ Wags First Aid. Instructors teach the Walks ‘N’ Wags Pet First Aid program in many different Canadian cities with expansion into the United States. Lisa Wagner is the Owner and Operations Director of Walks ‘N’ Wags Pet First Aid, and lives in Vancouver, BC with her husband, two children, dog Tux and cats Kitty & Kermit. There is also a distance learning program available, and Fidose of Reality is excited to take part because our priority is keeping pet parents informed on the health and wellness of dogs. Over and over, we are told that brushing a dog’s teeth is important. Are you performing a daily gum check? Check your dog’s gums to ensure they are a natural pink color. If dogs have blackened gums, then check their tongue. One of the first signs in many illnesses in dogs is pale gums. If gums are white or jaundiced (yellowed), get to a veterinarian/emergency clinic immediately. Immune-mediated hemolytic anemia (IMHA) refers to destruction of red blood cells by the body’s own immune system. IMHA and other diseases, like IMT (Immune-Mediated Thrombocytopenia) may manifest with pale gums as an initial symptom. IMHA destroys red blood cells, which to carry oxygen. When red cells decrease, less oxygen is available to the cells of the body. 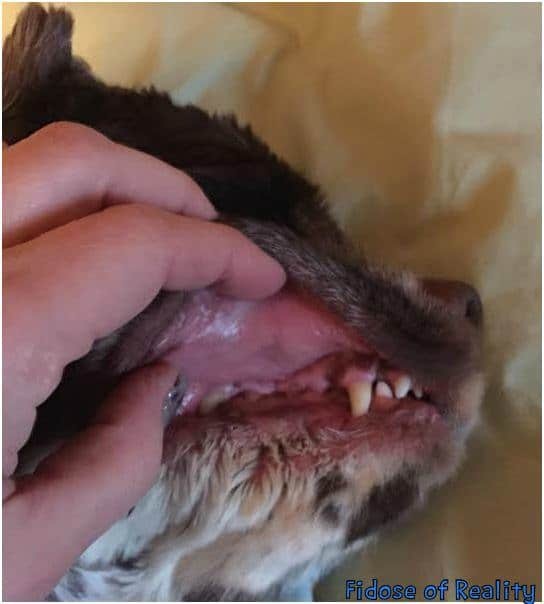 This is why teeth brushing is so crucial: You need to look at a dog’s mouth. Look for any lumps or bumps, too. The sooner a dog is accustomed to have you touch his face and mouth gently, the more accepting he will become of the process. Our dog is a pro. Check gums – these are healthy and normal. If an accident or an unforeseen confrontation happens, you need to rush the dog to a vet. The product, PetClot, is something we’ve yet to use, knock on wood, but stops bleeding fast, safe, and effectively. Place pressure over the wound, leave in place, wrap, and transport the dog. When a blood vessel gets too small for the high pressure flow going through it, high blood pressure can develop. Dogs can indeed be affected by high blood pressure. According to VeterinaryPartner.com, many diseases in pets are associated with high blood pressure, including renal failure, hyperthyroidism, Cushing’s disease, and diabetes mellitus. Like people, blood pressure is identified during examination. Blood pressure in pets is performed similar to the way it is performed on humans: an inflated cuff is fit snugly around the dog’s foot or foreleg. Some articles indicate the base of the tail may be used at times. An ultrasound probe is then used over the artery, since a stethoscope is not sensitive enough. Like people, however, pets can have a high blood pressure reading at the vet due to being nervous, but maintain a normal blood pressure otherwise. Wheezing, sneezing, and other respiratory issues may indicate illness. At rest, the average dog should breathe 15 to 20 times a minute. Dogs who pant heavily on a regular basis without physical exertion require veterinary care. Though allergies, pollen, and chemicals in the home (think air fresheners, candles, cleaners), can affect a dog’s airways, so can other issues. The canine version of the flu, a cold, heart disease, kennel cough, or aspiration pneumonia can be the underlying cause of a cough. If your dog begins pressing their head against a wall or floor, this is an emergency. Usually this means damage to the nervous system or neurological issues are occurring. Causes vary and may include: Stroke, encephalitis, poisoning, tumor, or other reasons. Dogs who pace, walk in circles, seem disoriented or confused, or begin staring at walls should see a veterinaian as soon as possible. A broken nail can be very painful. An overgrowth of fur between the pad surfaces means dogs can slip on flooring. Any cuts or wounds on a paw pad need immediate attention. Visually inspect your dog’s paws while using touch to feel for anything unusual. When is the last time you checked your dog’s treat and dog food expiration dates? If you have no idea of the expiration date, time to chuck ’em. Dogs can get sick or worse with treats gone bad. You wouldn’t drink old milk right? Dogs are the same way – bad treats are bad treats. If you can’t remember when you purchased that bag of treats, better to be safe than sorry. Take a half hour on a weekend and clean that treat closet or bin out. Expired treats can harm a dog. Let go of expired treats and food. In a dog or a cat, pet parents will see symptoms including diarrhea, decreased appetite, fever, and excess salivation. Pets also appear very tired. Diarrhea in some animals may have blood or mucus. If Salmonella is suspected in either a human or a pet, it is critical to contact your healthcare professional as soon as possible. o What is the company’s protocol for testing their products? Does their website talk about quality and safety? Many dog parents have heard of Xylitol, an artificial sweetener added to many sugar-free products. Cocker mom, Angela Kussman, found out how harmful Xylitol can be when her dog, Boomer, got into her Xylitol-based breath mints and nearly died. He has made a full recovery but other dogs are not so fortunate. Click here for some of the many products that contain or may contain Xylitol. Even a new brand of peanut butter is using Xylitol as an artificial sweetener. Be sure to read labels closely. Smell your dog’s latest toy. Phthalates give a product a “vinyl” smell. According to an article published by Whole Dog Journal, if a vinyl product smell lasts with time, the amount of phthalates it contains is really high. Many dog toys used phthalates in their manufacture. The article is quick to point out that not all phthalates have been studied to determine the danger and degree, Read our entire article on the Seven Dangers of Dog Toys. Stay with us as we begin our journey on first aid for dogs through the Walks ‘N’ Wags Distance Learning Program. We encourage you to sign up for the Walks ‘N’ Wags Distance Learning First Aid course with us. Note that although you have a year to complete the course, most folks end up taking it in 12-20 hours. It is self paced, and we are very excited to begin. The prices are affordable, and we like the idea of doing this program at our own pace. Call this phone number for Customer Service and to register: 1-800-298-1152. Tell the operator that you want to use code “FIDOSE OF REALITY” and you will receive 15% off distance learning until October 31, 2015. Do you feel prepared to help your dog in the event of an emergency? Note: We are not being compensated to share this program; Fidose of Reality wants dog moms and dads to be the best parents they can be! A fly got into my house earlier this summer and before I could swat it, Milo ate it. I was HORRIFIED. I had no idea dogs did that and I definitely had no idea it could be toxic. Rebecca, it’s true having that peace of mind is very empowering. If you don’t already have Pet First Aid training, our program is designed for both dog and cat owners. All the best. These are great to know. I didn’t know that bugs could be very dangerous to them. This is a great post! I tend to freak out and emotionally lose my mind when there’s an animal emergency. So I’ll have to reconsider and calm down now that I’ve read this! This is a great list of things to look out for and things people don’t always think about. Thank you…sharing. WOW Who Would Of Thunk Ladybugs Lots Of Great Information & What A Great Service I’ll Have To Check It Out Thank You! Great post! These are wonderful tips! My friend just had to run her dog today. She was choking – so scary! Wow! So much information! Great post! My dogs love eating bugs and it is very hard to stop them when they are outside exploring. There is lots of great info in this post. I need to read it again. The first aid course sounds awesome. Thank you for your compliment about our program :). We do not have our dof anymore. I always tried to be prepared. You can speak directly to a vet who will advise you on first aid and when you should get to a veterinary ER. When two of my fosters managed to get into my Christmas gifts and eat 2 pounds of chocolate, I called in a panic. They walked me through the process of making them throw up and advised me on aftercare. The whole thing cost $75–well worth it! Being prepared is so important….I have the vet phone number on the fridge on our emergency sheet. Definitely sounds like a wonder program. Keeping pet owners informed and educated. Such helpful info, thank you. Our pets are true members of our family! I have two dogs and never heard of some of these issues! Thank you for sharing! Thank you so much for this incredibly informative post! Such important warning signs to be aware of. I love the Petclot product, I’ve not seen that one before. I know I wouldn’t be prepared if an emergency happened with my girls. Thank you for this valuable information. I worry about the cat eating bugs that have walked through bug spray. Your program sounds like it will be super helpful! I remember the wheezing being scary when it happened to our little dog when I was a kid. I was too little to know how to help. Great tips! I had no idea that some of these were symptoms of something bad happening, thanks for sharing! I check Rooney’s gums every day so I know exactly what color they should be. This is my go-to if I think he isn’t feeling well. This is a great (and extensive) list of tips. The xylitol one is important-lots of things have xylitol as an ingredient, and since its a newer thing people aren’t aware of the dangers! Every new dog owner needs to read this post! I didn’t know that the color of your dog’s gums could indicate signs of a disease. I’ve recently found out that brushing my pet’s teeth is important, so I w9ill have to remember to inspect his gums while I am at it. If I ever notice a change in the color, I will contact an emergency vet. It would probably be a good idea to save their number on my phone so that I won’t have to look it up in an emergency like that.